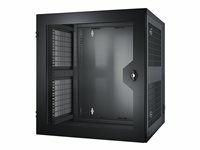 NetShelter WX enclosures are specifically designed for networking professionals to securely store and wire 19" EIA compatible equipment such as hubs, routers, concentrators and patch panels. Typical applications include small hub and LAN applications within wiring closets and computer rooms with floor space constraints. The NetShelter wall-mount enclosure mounts directly to building walls without occupying valuable or unavailable floor space. Rubber feet are provided with the enclosure for those applications that require floor mounting.The company offers its NetShelter WX wall-mount enclosure 13U with a vented door.